Set on 12 acres, the Round Hill is a Private Estate wedding venue that has been designed to stand apart and appeal to those who want something different for their celebration. While its Tara-like curbside impression is one of grandness and majestic grace, the feeling upon entering Round Hill’s doors is one of intimacy, the familiarity of going into someone’s beautiful home. Your guests are free to stroll and meander through the parlor rooms which include three fireplaces, porches, decks, pond site and garden pathways. 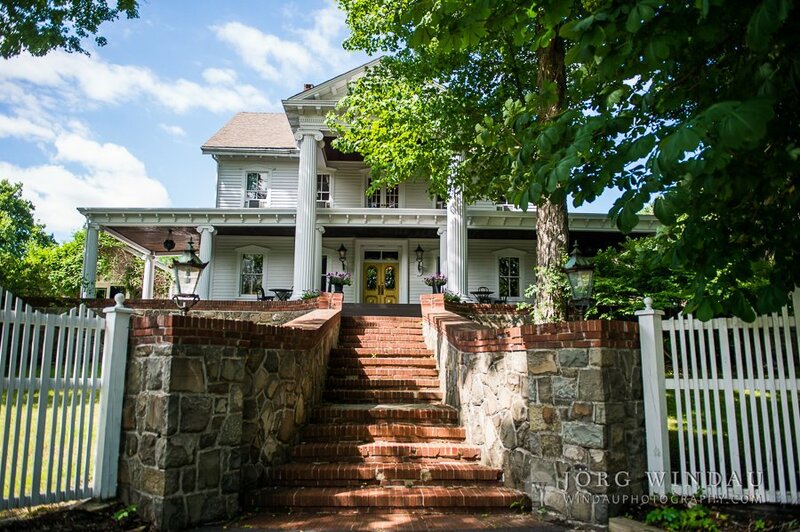 Tastefully appointed with its original moldings, hardwood floors throughout, Tuscan colored walls, Tiffany-styled light fixtures, original fireplaces and 30’ mahogany bar, Round Hill is unique among catering venues in the Hudson Valley. At Round Hill, more than 200 guests can be comfortably seated in one spacious room. Your guests can dance freely and without inhibition on a 1,600 square foot dance floor joined to the dining room by five sets of French doors. While your guests can enjoy conversations at their tables without being blasted by high volume music, those who wish to dance may do so in a magical party space. Round Hill features a separate outdoor garden ceremony area as well as an interior ceremony space in case of bad weather.